What can Jeff Bezos, CEO of Amazon teach higher education leaders about international enrollment sustainable enrollment? A recent ranking by the Harvard Business Review identified Bezos as the Best-Performing CEO in the World based on long-term results. Bezos demonstrated his passion in a 1997 letter to Amazon shareholders when the company went public. “Because of our emphasis on the long term, we may make decisions and weigh trade-offs differently than some companies,” Bezos wrote. The recession has fuelled short-termism among higher education institutions in terms of their student enrollment goals. The fiscal challenges, competitive landscape and complex markets, have increased the pressure to on colleges and universities to adopt quick fixes. These short-sighted strategies not only resulted in poor experiences for international students, as well as financial and reputational risks for the institutions involved. In order to successfully recruit and retain international students, higher education institutions must move toward sustainable enrollment strategies that seek to maximize long-term value. 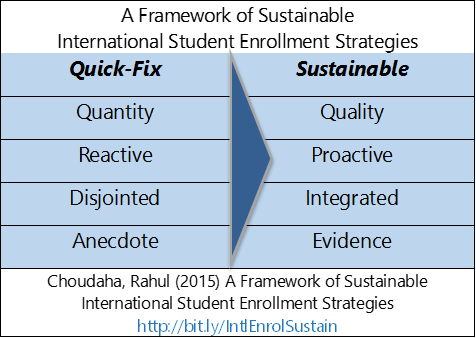 These are the four questions every institution needs to ask itself in order to move from quick-fix international enrollment strategies to sustainable ones. 1. Are you focused on quantity at the expense of quality? 2. Are you reacting instead of proactively planning? 3. Are your efforts integrated with those of other campus stakeholders? 4. Are your decisions based on evidence? International student enrolment is a complex, costly and competitive endeavor. It can become even more challenging when ill-informed, short-term and quick-fix approaches are used. In order to create successful, sustainable strategies, institutional leaders must work towards long-term solutions. Is your institution making the right trade-offs as Bezos made to create sustainable, long-term international enrollment strategies? Here is the link to my full article on University World News. This makes a lot of sense, higher education (as well as corporations) should not make decisions based on quick results. Planning for the future and mapping out goals should always be the focus. These 4 simple questions will help ensure I am making investment decisions and not impulse and ill-informed decisions.